Please review all rules to avoid penalties (minutes added to finish time) or disqualification. To qualify as a competitive category winner, teams must follow all rules. All teams must fulfill the volunteer requirement. Failure to abide by either of the Volunteer Options will result either in the team being unable to participate or in their disqualification. All waivers must be signed and turned in at the start in order to participate. They will be accepted at the registration table on race day. If waivers are not signed by ALL runners, volunteers, and van drivers, teams will not be permitted to participate - no exceptions. Teams that "fudge" their 5k times to earn an earlier start time will have a 1 hour penalty added to their finish time. This penalty will be accessed if a team finishes 1-hours earlier than their predicted finish time. The rules are for everyone’s safety. PLEASE ALWAYS USE EXTREME CAUTION during the entire race. There are no road closures, traffic control, or aid stations. All runners and teammates must be very aware of vehicle traffic at all times as several of the Exchange Points are along busy roads. Always run against the flow of on-coming traffic unless stated otherwise. Vehicles must drive ahead to the next Exchange Point or Van Exchange to ready the next runner. Follow traffic laws - trailing runners or forcing runners onto the road by obstructing the shoulder is prohibited. All teams are limited to 1 vehicle to transport runners along the route. SUVs, minivans and vans are preferred. (Motor homes, campers, buses, trailers, or limousines are not permitted). All team vehicles must display a "CAUTION: Runners on Road" sign (minimum 17 x 22 inches) throughout the entire race on the rear. Signs may be hand-drawn, but must be legible and clearly visible to all traffic. All team vehicles must also have their team number (signs provided at the start) displayed on the passenger side of the front windshield and on a driver's side window of their vehicle. Parking at many exchanges is on the shoulder of the road. Vehicles may NOT stop or park within 500 feet BEFORE Exchanges. Please park beyond the Exchanges or in the designated parking areas before exiting vans. DO NOT BLOCK AND DRIVEWAYS! 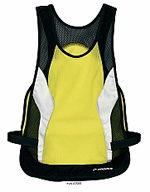 All runners need to wear their team numbers (bibs) visibly in front. 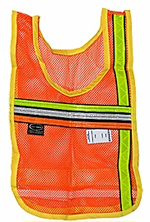 Due to probable overcast conditions, the wearing of reflective vests is necessary as it will increase visibility. Runners and vans must stop at red lights. At many of these intersections, a race marshall will be present and will give you clearance on when to cross. Obey volunteers and respect private property. Properly dispose of trash and use the portable toilets. 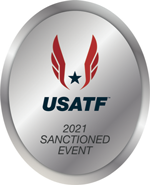 Any runner spotted littering (even the smallest energy gel packet), or urinating/defecating on private property, will cause their entire team to be immediately disqualified. We are guests in the towns and roads along the race route – please act as such. Any runner reported to have verbally abused a volunteer will cause their entire team to be disqualified. Incoming runners must "hand off" to outgoing runners only at the Runner Exchange Areas designated by the exchange sign in the traffic cone. Each team is required to turn in a completed Scoring Sheet with each runner's leg time. Scoring sheets are available on the Handbooks Forms & Logos page. Runners must maintain the order submitted at the Start on the Roster/Waiver. Masters teams must submit a photocopy of each runner's driver license at the Start. If a runner becomes injured or ill and is unable to finish (i.e. cannot walk), the next runner in the rotation may substitute at the point of injury and continue. To report a rule violation that will affect the results (top three finish in your category), submit a Protest Form (included in your race packet) to a Relay official within 30 minutes of crossing the finish. If it is a rule violation (a runner wearing a headphone), please report it as soon as possible. Prior to submitting the form, the protesting team must notify the accused team so any misunderstandings can be settled.